Rosacea, that chronic inflammatory skin condition, is far from life-threatening but it can affect your self-confidence and self-esteem. And, in extreme cases—much like teenage acne—it can make you want to avoid social situations and even retreat from life. Fortunately, there is much that can be done to treat rosacea and minimize its appearance and impact on our lives. Symptoms generally appear in your thirties or forties and can wax and wane throughout life. You may first notice that you have a tendency to easily blush or flush. Or your skin may look like you’ve gotten some sun or had a drink or two. Rosacea can spread beyond your face–particularly your cheeks–and make your back, chest and ears look flushed. According to the National Rosacea Society, 16 million Americans have it. If you’re among them, you’re not alone. 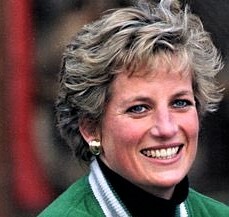 Princess Diana (and Prince William), Cameron Diaz, Renee Zellweger, Bill Clinton, and W.C. Fields all have/had rosacea. In fact, two of our editors have rosacea and they’re in their 60s. First, let’s get a better understanding of this very common skin condition. Then we’ll take a look at topical treatments, products we can use to camouflage it, and laser treatments. There are four main types of rosacea. This is the most common form of rosacea, the one that gives us those flushed red cheeks. That skin ‘flush’ is an inflammatory response similar to what happens when we bruise or break a bone: the blood rushes to the damaged area to help repair the damage. This constant flushing—caused by the blood vessels abnormally swelling and emptying—strains them so they lose their elasticity. Having been stretched to their limit, they are weaker and no longer have the elasticity to resist and empty as easily. Hence, the red face. 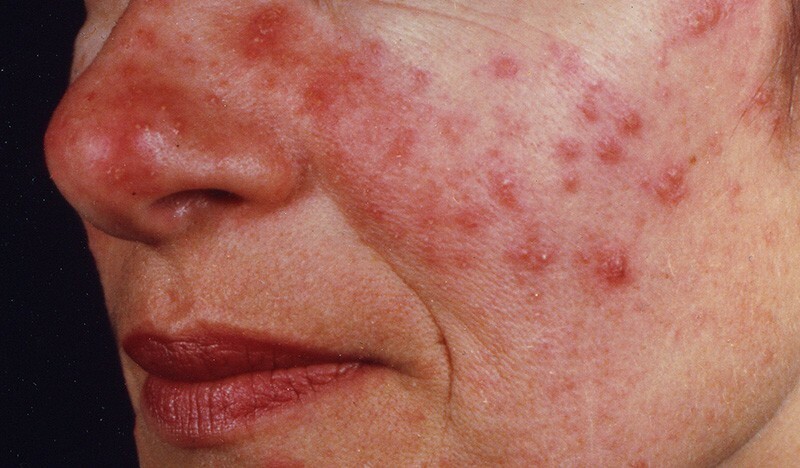 Papulopustular rosacea is characterized by acne-like breakouts, and often affects middle-aged women. Although it looks like acne, as small red solid bumps or pus-filled pimples often develop, this is not the acne of the teenager years. With rosacea, there are no blackheads and there may be a burning or stinging sensation. 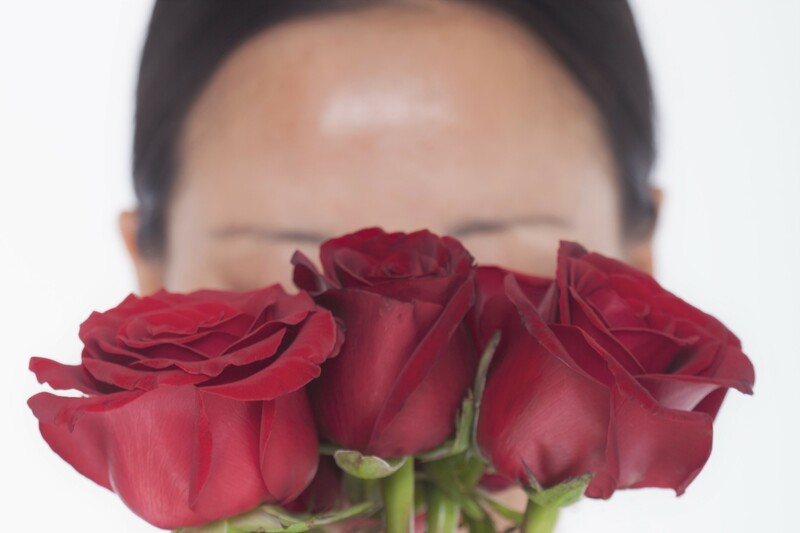 Papulopustular rosacea can be every bit as upsetting and embarrassing as teenage acne–particularly for women who suffered during their teenage years and thought those days were over. Just as its name implies, ocular rosacea affects the eyes. It is characterized by eyes that may be irritated and appear watery or bloodshot. 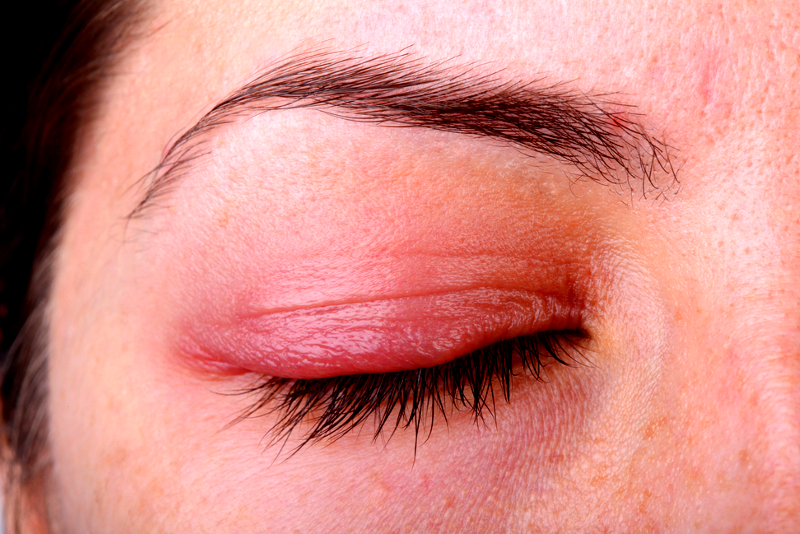 Eyelids may become red and swollen and sties are common. You may also see crusts and scales around the eyelids or eyelashes, as well as visible blood vessels. Severe cases can result in corneal damage and loss of visual acuity if medical help is not sought. This type of rosacea can thicken the skin. 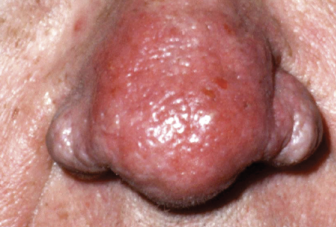 One of the most common and noticeable variants of phymatous rosacea is rhinophyma or skin thickening of the nose. We see this more frequently in men. It can become so severe that it actually makes the nose become deformed. You may even have misjudged an older male with a reddened, misshapen nose to be a life-long, heavy drinker—when, in fact, it could well be the result of phymatous rosacea. It is possible to have only one type of rosacea or more than one at the same time. For example, the most common kind, erythematotelangiectatic rosacea, is often associated with the dry, red irritated eyes of ocular rosacea. The causes of rosacea are not clearly understood. Genetic and environmental factors appear to be involved and there is frequently a family history. Some possible causes include vascular irregularities, facial mites and bacteria, the use of steroids, and environmental factors. However, since rosacea has been linked to specific groups of people with fair skin, and many of these suspected causes affect a wider cross-section of people who never get rosacea, these causes don’t appear to account for those who will ultimately have rosacea. What triggers can make it worse? A survey of 1,066 rosacea sufferers conducted by the National Rosacea Society reported certain rosacea triggers. 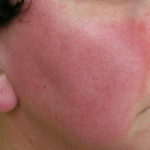 Sun, heat, and stress are almost univeral triggers for rosacea. You can track your exposure to them and the other factors o the list below to see how your skin responds, then avoid those situations in the future. What can we do if we have rosacea? We have as close as one can get to an ‘expert’ at Blue Hare magazine, our beauty editor, Clare. She has had erythematotelangiectatic rosacea (skin flushing with visible broken capillaries) for thirty years and has tried just about everything. She has added her own hands-on experiences to our discussion. The two most common topical medications approved by the U.S. Food and Drug Administration (FDA) for treating both erythematotelangiectatic and papulopustular rosacea are Metronidazole (often referred to as Metrogel) and Azelaic acid. Metrogel has been tested in a number of clinical trials. Its effectiveness was assessed by papule/pustule (acne like eruptions) counts, erythema ratings (levels of redness) as well as global rosacea scores by physicians and opinion scores by patients. Metrogel is well tolerated and is the recommended topical therapy for rosacea. Azelaic acid was determined to be effective and safe in clinical trials, leading to FDA approval. Studies reveal that azelaic acid is comparable to, or exceeds the clinical effectiveness of metronidazole, in treating erythema, nodules, papules, and pustules but not effective for telangiectasias (broken capillaries). The FDA has recently approved a newer topical medication called brimonidine. It is marketed under the name Mirvaso. Applied to the skin as a gel, it has been effective in reducing redness. It works by constricting blood vessels. Results appear in as little as 12 hours after application. The effect on the blood vessels is temporary, so the medication must be applied regularly to maintain any visible improvements. There does not appear to be any cumulative benefit in reducing facial redness. There are a number of other topical medications with varying degrees of side effects, including causing birth defects if a user is pregnant and impacting cardiovascular disease. Metrogel and Azelaic acid have stood the test of time. Their side effects—stinging or itchiness–are limited to the immediate area of application. Clare’s experience: Topical medications have not worked for me. I was prescribed Metrogel over thirty years ago. 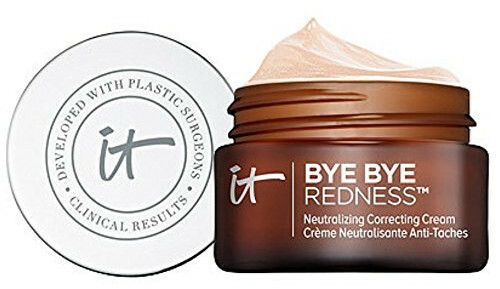 I used it for the prescribed period of time but did not notice any reduction in redness and decided not to refill my prescription. My doctor did not recommend Azelaic acid, most likely because I had broken capillaries on my cheeks that contributed to the overall redness. Azelaic acid is not effective for broken capillaries. And I decided against the Mirvaso because the rebound redness wipes out the temporary benefit. 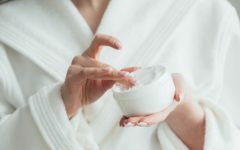 Despite new topical cream introductions to the market, there has been very little advancement in treating or curing the condition. According to Medscape, Metrogel is still the first line of defense against rosacea. Of course, as with any prescription, some people have greater success than others. The Mayo Clinic states that antibiotics used for rosacea can help reduce some types of bacteria but they are prescribed more often for their anti-inflammatory properties. Doxycycline is an antibiotic taken as a pill for moderate to severe rosacea with bumps and pustules. Other similar oral antibiotics like tetracycline and minocycline, are also sometimes used but their effectiveness isn’t as well-supported by studies. The problem with oral medications compared to topical creams is that the side effects may not be worth the risk. And the fewer antibiotics we take the better; that time may come when we need them to work at their peak in a life-threatening situation. You may have tried, or are tempted to try one of the green-toned color correctors/primers made specifically for milder forms of rosacea. The theory is that because green and red are opposites on the color spectrum, green cancels out the red. 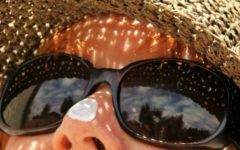 It works like this: use a sunscreen all over your face with an SPF of at least 30. Apply the green-toned color corrector/primer only in the areas where you have rosacea. Cover the area where you have used the color corrector with foundation that matches your skin color. But does it work? Clare’s experience: Covering anything up with makeup to achieve a natural look is tricky, particularly as we age. I have tried numerous green-toned primer/correctors over the years to cover up my flushed skin and broken capillaries. The problem is getting the right amount of green primer/corrector to cover the redness. If you use too much, you look as if you have green skin; if you use too little, the redness still shows. It is almost impossible to get just the right amount of product. Another solution is the right skin-toned foundation. To effectively cover redness, however, you need a lot of product to get maximum coverage. And we know what a lot of foundation looks like on your face, particularly if your skin is dry—it makes you look older. However, I found three outstanding skin-toned cover-ups that work exceptionally well on aging skin to cover redness and, at the same time, manage to look natural. I usually have all three on hand and alternate when I use them. Jamie Kern Lima, co-founder and CEO of IT Cosmetics, struggled for years with rosacea. As a former news reporter, she was embarrassed about the way her skin looked on TV. She couldn’t find makeup that would cover her rosacea and still look natural so she, along with husband, Paulo, set out to make it. What makes this powder different from the scores I have tried is that it doesn’t cling to dry patches. Most women our age think, “Powder foundation? 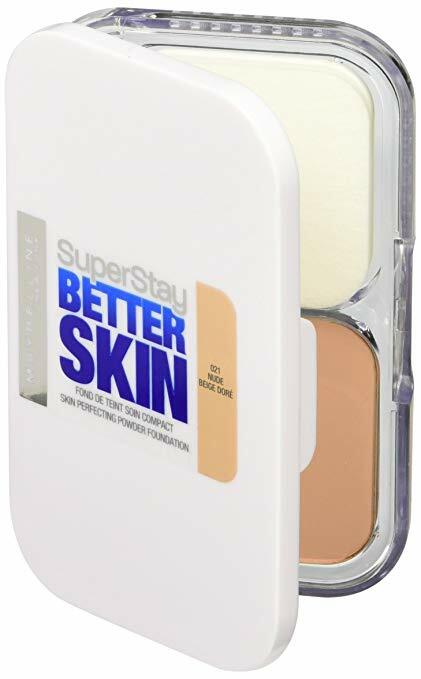 Too drying.” This powder somehow morphs into a creamy finish, doesn’t accentuate lines or dry patches and manages to cover up red without looking overdone. And it’s a drug store product. This is a staple for me. I hope Maybelline never discontinues it. Find it at major drugstores or at Amazon.com. 3. Infallible Fresh Wear 24 Hour Makeup by L’Oreal Paris. L’Oreal describes this product as their “most light weight, breathable makeup ever”. Of all the liquid makeup I’ve tried, this one gives the most skin-like finish to the skin. You can get medium to full coverage and still look as if you are not wearing a lot. Find it at major drug stores or at Amazon.com. IPL therapy is a treatment administered with a laser by a qualified technician in a clinic. The procedure typically takes about 30 minutes. Intense pulses of light are used to penetrate deep into the skin. The result is called photorejuvenation. It causes collagen and blood vessels below the epidermis to constrict, reducing redness and age lines. It works best on erythematotelangiectatic rosacea, the most common kind. The procedure involves only minimal discomfort. The redness and swelling that sometimes occur after treatment disappear anywhere between a few days to a few weeks. Most benefits of the treatment appear gradually in the weeks following treatment. Depending upon the severity of your rosacea, you may need a series of treatments. The success of IPL depends upon the skill of the technician administering the treatment. Make sure you know as much as you can about IPL and be sure to read reviews. 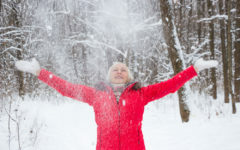 Clare’s experience: I had IPL twice in my late thirties and late forties. It definitely worked for me. However, just about every laser technician will underestimate the amount of time it takes before you are back to “normal”. Immediately after the treatment, my face was very red and swollen so that I felt self-conscious going outside. I had some redness and swelling for at least two weeks after my treatment. I found that IPL was less effective on general flushing and worked much better on individual red veins around my nose and across my cheeks. The overall result was good enough to reduce that red-cheeked appearance; makeup took care of the rest. Over the years it seems my rosacea has calmed down so I won’t need any additional IPL treatments. If you have time to hide away for a week or two, IPL is worth the effort. It reduces redness effectively but doesn’t prevent redness and broken capillaries from reoccuring. Do some research and decide for yourself. Use emollient, non-comedogenic moisturizer and mild, fragrance-free, soap-free cleansers. They should have a non-alkaline or neutral pH level. Avoid astringents and other skin-care products with alcohol, menthol, eucalyptus oil, clove oil, peppermint, witch hazel, or sodium lauryl sulfate. Use lukewarm water to wash your face and avoid steaming hot baths and showers. Steam rooms and saunas are not good for rosacea sufferers.